Hello my dears! It has been almost a month since I shared a look here on the blog. I've been focusing on other things in my life that definitely take precedence. This blog has been a fun hobby for me, but just like any hobby, sometimes it's healthy to give them a break. By the way, I want to welcome my new subscribers and I also want to say thanks to my longer term subscribers for sticking with me. Today, I'm showing you a monochromatic look that I put together that really turned heads everywhere I went (pardon my confidence) and had kind comments on my Instagram post. 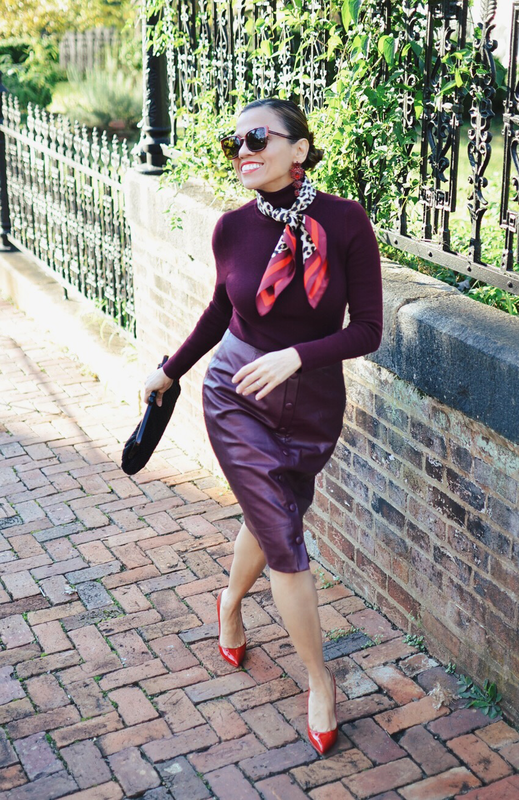 When I put this look together, I was thinking about the ladies that would love to wear something fun and bold for the holidays, but without wearing sparkly objects. I personally love, glitter, sequins, beads and metallic hues, however, once in a while, I don't mind to stand out with a look that doesn't contain any of them. One way to shine and stand out without the bling bling is wearing a monochrome look or even a tonal look. This styling can be done with any color of the spectrum, however, it works even better when you chose a striking or rich hue such as the one I'm wearing today. The trick with this styling is to commit to wear mostly one hue only and limit to one or two small pieces from other hues that would bring an interesting contrast to the ensemble. Another important thing to consider when wearing a monochromatic look is to add different textures. This helps to create some sort of dimension or separation in between the pieces in your outfit. As you can see, I did not wear one glittery piece and yet, I managed to achieve the same eye-catching effect than shiny objects can do. I hope you all have a wonderful Thanksgiving day next to your loved ones. 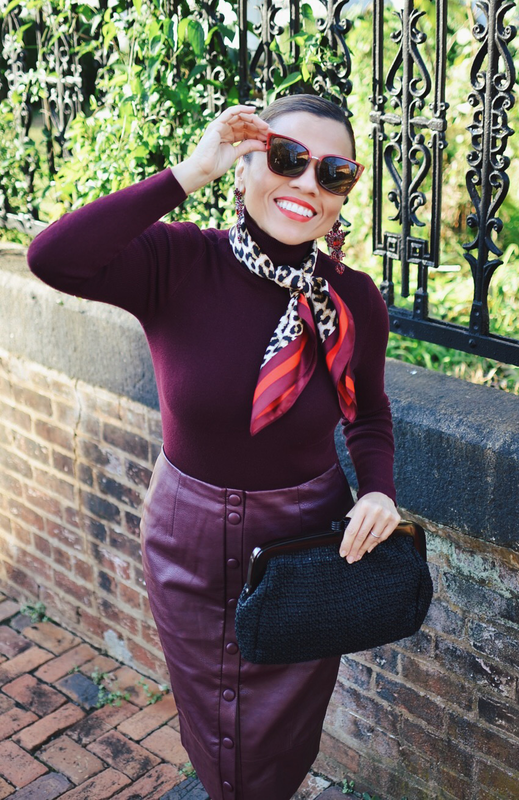 Turtleneck: c/o Chicos/Skirt: c/o Chico's/Scarf: c/o Chico's/Sunglasses: Chico's/Earrings: Givenchy. Similar/Shoes: Christian Louboutin/Bag: Vintage. Similar.